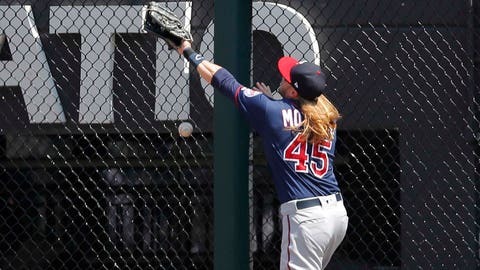 The Minnesota Twins placed outfielder Taylor Motter on the seven-day disabled list with concussion-like symptoms Friday afternoon. Motter crashed into the outfield wall Thursday during the Twins’ win over the Chicago White Sox, but remained in the game. The Twins selected the contract of Triple-A catcher and infielder Willians Astudillo to replace Motter on the 25-man roster, while right-handed pitcher Felix Jorge was designated for assignment. Astudillo has hit .290 with 25 RBI, 12 doubles and seven home runs in 49 games with Triple-A Rochester this year and was named an International League All-Star this year. Jorge, 24, started two games for the Twins in 2017 but had pitched just two games this year in Rookie ball on a rehab assignment.